Since 2014, Matt Moser and Grafting Systems™ has been collaborating with Oliver Agro of Verona, Italy to help introduce their specialized horticultural machinery into the United States market. 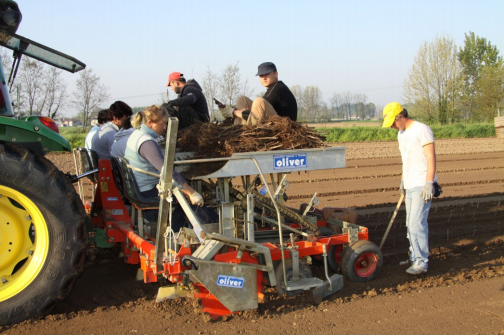 Oliver Agro produces very innovative, specialized machines predominantly for fruit tree nursery production including rootstock production. They also produce many other machines useful in the production of nursery and vegetable crops. Oliver Agro has the world-wide patents on Rotosark®, which is a unique cultivation tool like no other, which is very useful in both organic and non-organic production of crops. Since finding efficient, productive, and “enough” labor is a major concern for most nursery and vegetable producers, look to Oliver to many labor saving machines which will make your operation more efficient, productive, and profitable. Contact Matt Moser regarding any of the Oliver machines listed below, and we can start a discussion on how to help make your operation more efficient. Click on the links below to view or download a PDF file of the specified machine.